FREE Goldfish Crackers at Smith's! Goldfish are on sale at Smith's for $1! = FREE! (will round up to $1 until 6/29) Print it TWICE! 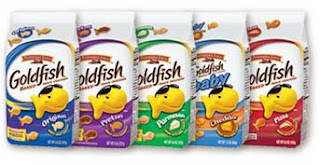 UPDATE: The e-coupon on Smith's site is gone but there is one for the Goldfish Grahams on Shortcuts! The ad say's these are $1.25 but at the Salt Lake store they were labeled $1 and rang up that way too. Either way...CHEAP! I don't see the e-coupon for the Goldfish - am I missing something?? Wow, your right! The e-coupon is gone. I'll update the post. Dang-it! WAIT! There's one for the Goldfish Grahams on Shortcuts! There are 1.25 at my Smiths and they won't round up the coupons that you put onto your smiths card via their site just as an fyi. It must be a printed manufactured coupon. I did get a few Goldfish boxes for really cheap though! GREAT DEAL!! The best is deal at Smiths is the Smart Taste Pasta. If you go to their website and print off the coupons they round them up to $1.00 off and they are priced at $1.00 so free! They don't round up their store paper coupons either. :( But I love that your able to stack a paper coupon with an e-coupon! I love Smith's! Thanks for the reminder about the pasta. I still have free pasta comin' out my ears from the last sale!